Samyo was created to provide an opportunity to the many talented young musicians in the UK to showcase their talents. The orchestra provides a platform for young musicians to perform to wide ranging audiences, gaining the exposure that can take them to new levels of achievement. Samyo is unique because it presents the diverse styles of Indian music together, performed by dynamic young performers, all of whom are born and brought up in the UK. Because of their ability to understand and play both Western and Indian Music, the orchestra is an exciting phenomenon that has never been seen or heard before! 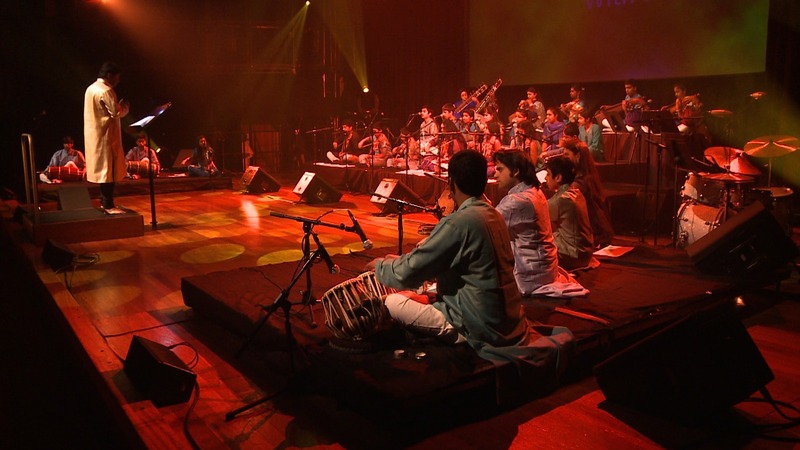 Founded by Milapfest in 2001, the orchestra exists to provide specialized training, development, and performance opportunities for young musicians of all backgrounds, who are under the age of 18 and trained in Indian classical music. The orchestra meets regularly throughout the year for training, rehearsals and performances. Each summer this programme is enriched by a week long summer school, Music India, where the conductors of Samyo are joined by guest tutors from around the world who add unique skills and expertise to the programme. Funded by Arts Council England from April 2012, SAMYO is a NYMO (National Youth Music Organisation). National youth music organisations offer invaluable opportunities and support for talented young musicians to develop their performance skills across a range of musical genres, regardless of their background. Find out more about our history, supporters and organisation in the menu to the right.